Located in south-eastern Pennsylvania, Philadelphia (nicknamed “Philly”) is the fifth-most populous city in the United States. It is populated by over 1.5 million residents and is home to a thriving economy, comprised of I.T., manufacturing, health care and tourism services. As the founding city of American independence, major attractions in the city include Independence Hall and Liberty Bell. Get ready to explore the city’s vast history and rich arts scene with cheap flights to Philadelphia! Philadelphia is home to Philadelphia International Airport (PHL), which is a 15-minute drive from the city centre. 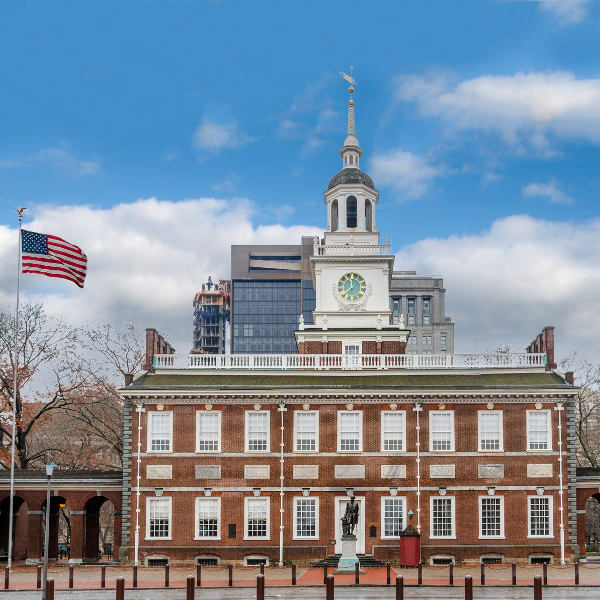 With its legacy in the American Revolutionary War, Philadelphia’s role in the history and formation of American life is highlighted at Independence National Historical Park, Independence Hall and Liberty Bell Pavilion. Philly’s bristling arts scene comes alive in its theatres, music bars and art exhibitions. Art fanatics should not miss the Academy of Fine Arts Museum, Philadelphia Museum of Art and the fascinating exhibits in Rittenhouse Square. Society Hill District houses a blend of 18th century buildings, colonial homes and restored warehouses; while the city centre is home to skyscrapers and architectural delights that range from Georgian to Gothic. Peak season in Philly is during summer, between June and August. There are wonderful festivals and summer concerts to be enjoyed; just be aware that the large crowds drive up hotel rates, making it an expensive time to visit the city. The optimal time to visit “The City of Brothers” is between March and May, when the brisk spring air brings a warm glow to the city. This is the ideal season for hiking and exploring the surrounding parks. You will also be treated to fewer crowds and reasonable accommodation rates. The icy winter months of November to February are not a popular time to visit, unless you’re after a snow-filled vacation. Although this is the cheapest time of the year to visit, some outdoor tours may be closed for the season. 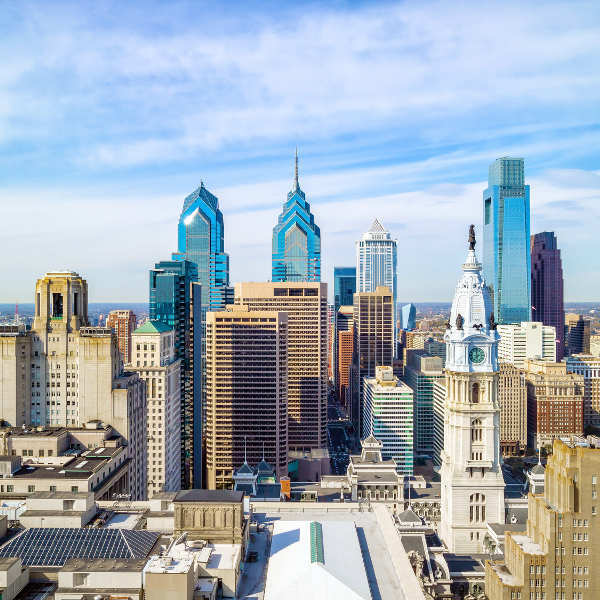 Despite Philadelphia being the fifth-most populous city in the United States, its charming streets feel as cosy and walkable as a small town, and its citizens are just as friendly. Often referred to as the “Birthplace of American Democracy”, Philadelphia saw the penning of the Declaration of Independence and the American Constitution. It played capital to the nation before Washington D.C. took over, and remains an economic power, an artistic centre, and a truly fascinating city to visit. 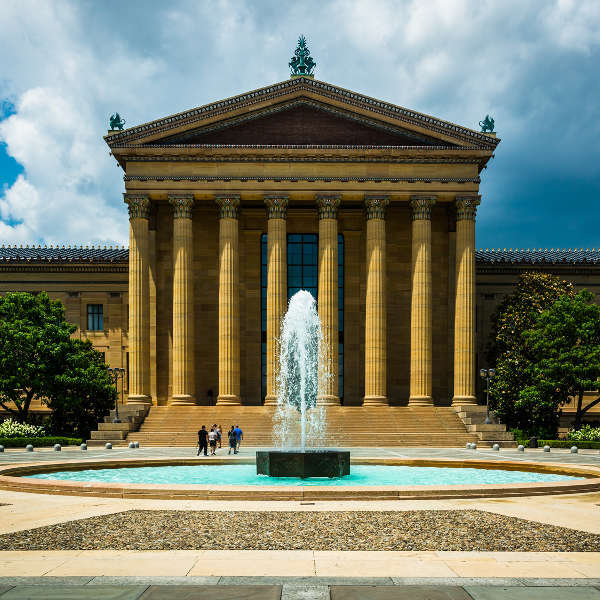 Embark on an historic journey through time at remarkable museums such as the Philadelphia Museum of Art, Eastern State Penitentiary, Independence Hall, and the Penn Museum, which showcases exquisite artefacts. If you’re staying for a few days, the CityPass gives you access to many landmarks, including the Franklin Institute, Adventure Aquarium, Academy of Natural Sciences, and National Constitution Centre. Home to a vibrant arts scene, you’ll find a variety of live performances happening around Philly, including live theatre, music and dance. Grab a famous Philly cheesesteak as you peruse the historic Reading Terminal Market for some handmade crafts. After a busy day of sightseeing, relax in the beautiful gardens in Fairmount Park, which boasts a driving range, horse and biking trails, a Japanese tea house, and endless summer concerts. Compare several airlines, and book your cheap flights to Philadelphia online at Travelstart! Philadelphia is a very safe city to explore. Most crime is concentrated in the northern and western parts of the city, but tourists should feel perfectly safe exploring the attractions within Centre City, Old City and South Philly. Exercise the usual safety precautions and do not leave valuable items visible in unattended cars.